There are all sorts of birds, leaves and many, many pine cones. Unfortunately my light chains are more visible this year than I would like them to be. Maybe I will get a new tree for next year, a tree that already has the lights on it would be nice I think. And this is what the tree looks like in daylight. I like to use my antique wooden hat box to stand the tree in and it does suit the theme. I can't believe it's Christmas in only 7 days. I am so far behind after being sick. I haven't even finished my gift shopping yet and don't even talk about wrapping everything up! Well, I better get my skates on and roll my sleeves up so things will get done in time. ...something little about me. I am hoping we will have a white Christmas this year. Right now we have a dusting of snow on the ground but it sure would be nice to actually snow on Christmas Eve and Day. I do love the white glistening fairies that fall from the sky ~ it makes everything look enchanted. The neat thing about me and my love for snow is ~ I was born in a small town way up in British Columbia, Canada. 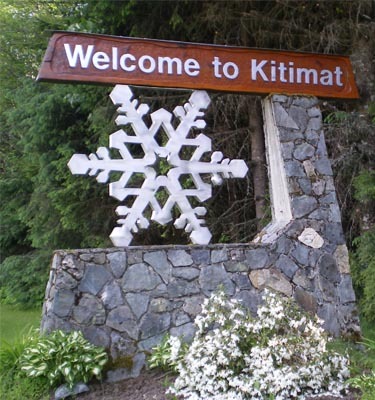 The town is called Kitimat, which is Native American for ~ People Of The Snow! Maybe that is why I love to sit and watch it snow ~ it's like it's just for me from home! This is the welcome sign you see just before you arrive at Kitimat. I hope you are all almost ready for Christmas, you are well and life is treating you kind. What a wonderful lovely tree you have. I didnot noticed the chains until you said it. Maybe because you made a close-up of it? Last year we had a very very white christmas. I donot think it will be a white christmas this year, but more important is, we are healthy and happy. What a lovely and charming tree! Hope you have a white Christmas full of wonder. That hat box is just perfect! What a pretty idea. Merry christmas! That is a lovely tree you set up!Very pretty ornaments.I happened upon your blog through pinterest.=-) I will start following your awesome blog!Happy Holidays!